The Research Laboratories of Archaeology lives within the College of Arts and Sciences at the University of North Carolina at Chapel Hill. A pretty highfalutin sounding title and not necessarily a place one might immediately go looking for public outreach or teacher resources in archaeology. Regardless, the site has a lot to offer. The Who We Are page lists the most recent accomplishments of the RLA and all deal with production or publication of educational materials geared at the K-12 level. One of the most compelling resources is the Intrigue of the Past lesson plans geared to the 4th – 8th grade levels. The five sections include Fundamental Concepts, The Process of Archaeology, North Carolina’s First People, Shadows of People, and Issues in Archaeology. Chapters within the sections range from the culture history of Native Peoples, ethics, rock art, artifact analysis, archaeology as a career, to name a few. The set of lesson plans are comprehensive and for the most part hands-on or participatory in nature to engage student involvement. The total package of lesson plans is a useful guide for similar projects in other institutions or regions. 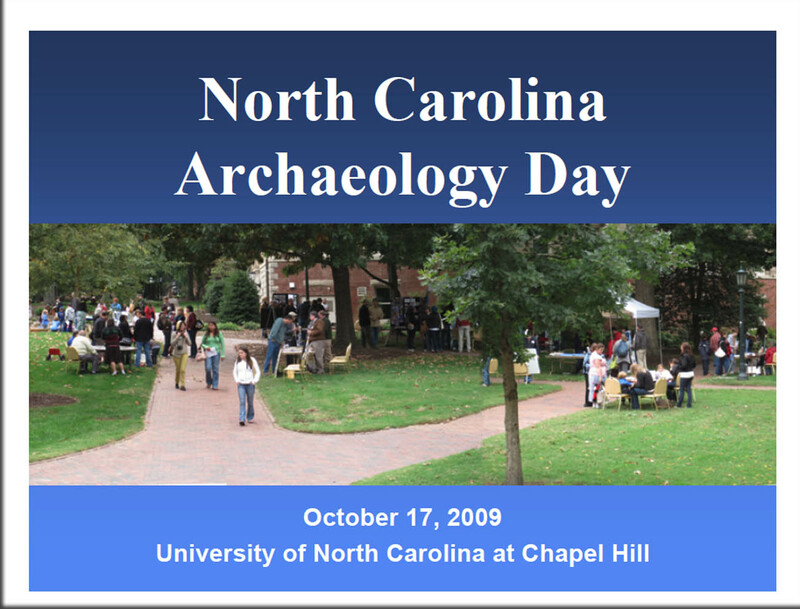 Other unique offerings on the site include a 2009 on-line course for teachers, Archaeology and North Carolina’s First Peoples taught by Theresa McReynolds through the Continuing Education Program at the University of North Carolina. As described on the link “This online course explores the science of archaeology and 12,000 years of North Carolina’s human past. Participants will be introduced to inquiry-based activities that can be adapted to meet their own teaching objectives.” The course runs 8 weeks and requires 5-7 hour per week commitment. The course sounds like an excellent model to equip public school teachers with archaeology basics for classroom instruction. Hopefully, this course will be ongoing. The RLA site also has locally produced videos that explore different archaeological concepts such as stratigraphy. Perhaps the most engaging part of the site is the electronic excavation of the 18th Century Native American Occaneechi site. Though somewhat static and without the bells and whistles often associated with on-line edutainment today, the scope, detail, and value of the excercise are impressive. The site has a set of links to other resources, a slide show on the 2009 Archaeology Day, links also to academic course offerings, field schools and recent research projects in the state, although this latter link is somewhat dated. Of note, the Collections Page contains a series of pdf files of catalogs for artifacts curated by the RLA along with associated records such as black and white photos and color slides – something many state facilities are moving toward, but few have accomplished. The site can be a bit confusing to navigate. For example, with the link to the on-line course noted above, I am not certain how I got there the first time but the only way I refound the page was by going back through my browser history. It seems that there are multiple links leading to the same thing – not a huge issue but a bit confusing. There are no links or discussion of descendant voices save a few several year old articles on Cherokee Potters. The RLA page is an impressive resource for North Carolina and a model of creative ideas for the rest of us. ← so, is this Facebook stuff worth it?